A stunning apartment for rent in Los Cristianos Tenerife with private roof terrace and a lovely sea views. A Perfect combination of peace and tranquillity yet close to the beach and centre. A stunning apartment to rent in Los Cristianos Tenerife with private roof terrace and lovely sea views. Set within the more exclusive end of Los Cristianos this apartment offers the perfect combination of peace and tranquillity yet is only a 10 minutes’ walk from the beach and resort centre for those who like it a bit livelier. This apartment offers quality accommodation within a select area in Los Cristianos. 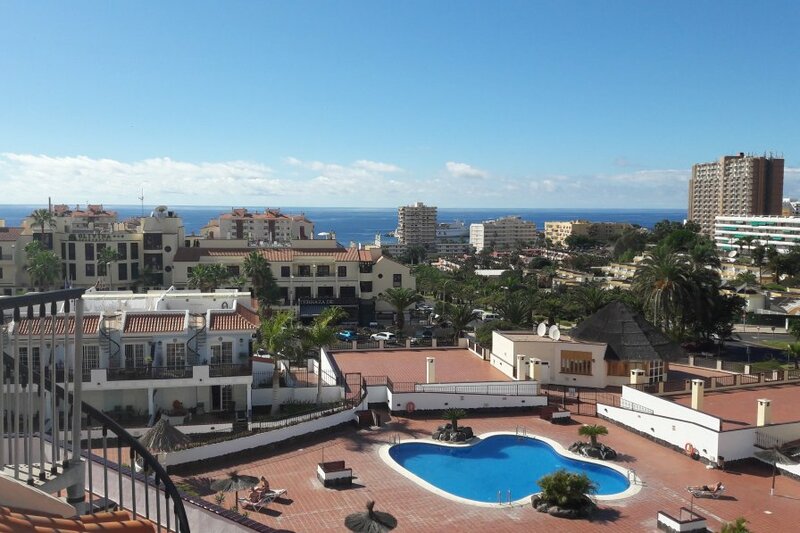 The complex of EL Mirador is a newer complex with lovely views over Los Cristianos to the sea and swimming pool. The apartment has a fresh and sparkling feel. It benefits from a larger than average sunny balcony (20m2) with lovely sea views over Los Cristianos. The balcony has a spiral staircase which leads to the roof terrace (40m2) with stunning panoramic views and of course all day sunshine!! The Living room has a sofa bed, armchair, TV, DVD and patio doors leading to the large balcony. The balcony and roof terrace has sunbeds, a patio table and 4 chairs and of course those lovely views out over Los Cristianos! The kitchen is fresh and full equipped. The bedroom has a huge fitted wardrobe, twin beds and patio doors also leading to the balcony. The complex has two swimming pools, both are real suntraps and are therefore ideal for sun worshippers. The complex is extremely well situated for all local amenities. This more prestigious area of Los Cristianos has some lovely restaurants close by, plenty of bars (including a Sports bar showing all the leading Sporting events), a well-stocked supermarket, car hire and excursion shops. The main resort centre area, Los Cristianos harbour and the beautiful beach at Las Vistas is a 10 minutes’ walk. Here you will find a large selection of shops, boutiques, nightclubs and some lovely sea front bars and restaurants. Patio Table and 4 Chairs, Beautiful Sea views over Los Cristianos. Spiral staircase to private roof terrace with panoramic views and all day sun! Tranquil Pool area, 2 Swimming Pools. 20 minutes from Airport, a 10 minutes’ walk to Los Cristianos centre and beach. 5 minutes driving to Playa de Las Americas. Las Americas and Adeje Golf courses within 5-10 minute drive.